In just a few days, on August 21st, 2017, the moon will pass directly between the sun and the earth, partially or completely blocking our view of the sun depending on where exactly you’re located. For our part here in Vermont, a striking partial eclipse will be visible for two to three hours starting around 1pm Monday afternoon, as the moon makes its way across the face of the sun. A solar eclipse, even a partial eclipse, is often described as a phenomenon that is not to be missed, but for those planning on enjoying the spectacle in all of its celestial glory, you have to protect your eyes. When the bright light from the sun floods the retina at the back of the eye, the sensitive cells there become damaged. The cells release chemicals when exposed to the sunlight that harm the retina itself, sometimes permanently. Solar retinopathy, as it’s called, can happen any sunny day of the week if you were to stare directly at the sun. The damage, though entirely painless, can be temporary, lasting weeks to even months, or it can be permanent. Since it doesn’t hurt, beyond the squinting, people don’t realize the damage the sun is actually doing to their eyes and their vision. During a solar eclipse, the majority of the sun itself is blocked by the moon, leaving only the corona visible. This outermost atmosphere of the sun is rarely visible beyond the bright light of the sun’s surface, but it is incredible intensity makes it extremely dangerous to view unprotected. Your everyday sunglasses do not provide enough protection for your eyes. Eclipse glasses are designed specifically to filter all but 0.003 percent of visible light, blocking out most ultraviolet and infrared light as well. The most reliable eclipse glasses on the market employ a thin layer of aluminum, chromium, or silver to diffuse the dangerous intensity of the sun’s light. Solar eclipses like the one slated for Monday afternoon, don’t come along every day, so it seems everyone is trying to cash in on the spectacle, even if that means selling knockoff or counterfeit eclipse glasses, and passing them off as the real thing. 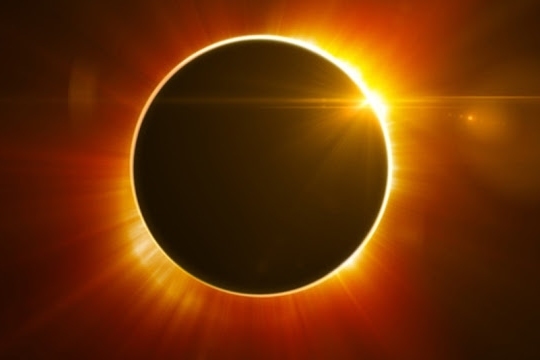 The American Astronomical Society has provided a list of reputable vendors of eclipse glasses, and other recommended ways of viewing the eclipse here: https://eclipse.aas.org/resources/solar-filters. NASA also has a wealth of information on viewing the eclipse safely at their special Eclipse2017 page. Remember, do not attempt to look at the eclipse directly without being properly protected. Do not attempt to view the eclipse through a camera, telescope, binoculars or anything other than dedicated reputable eclipse glasses from one of the vendors recommended on the pages above. If you think you may have taken an unprotected peek at the eclipse without protection, even for a few seconds, contact your optometrist immediately to set up an appointment. Wake up every day to the morning sun, and the best eyesight possible to see the world with. Berlin Optical Expressions eclipses every other game in town!